To no surprise, the main physical characteristic of the American Albino is a white coat, white tail and mane, pink skin, and black, brown, or dark blue eyes. 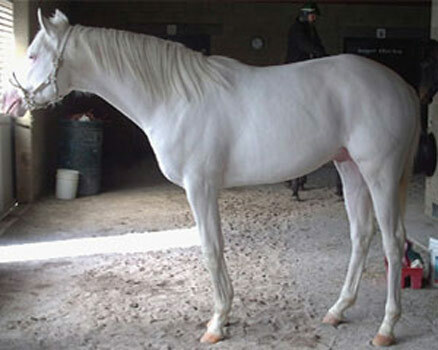 Outside of coloration, the American Albino is separated into a stock type horse, saddle horse type, and Arabian type, with separate categories for ponies. 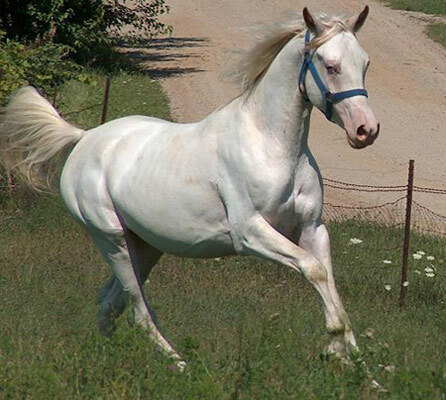 Because the American Albino is actually a color breed, it can carry the characteristics of its sires, whether Quarter horse, Arabian, Morgan, or Thoroughbred. For the most part they are known to be smart, tractable and even tempered. The American White, regardless of breeding, must have pink skin and truly white coloring. No slight pigmentation of hair allowed. A few, small scattered spots are permissible. The various eye colors common to horses are acceptable including amber and very pale blue and parti-colored. 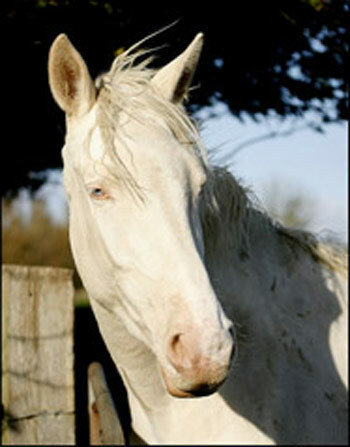 While the „albino“ is a color and not a breed, the Albino, or white horse, has been given a registry in America. In days of old, white horses were reserved for queens and kings, the bravest knights, Indian chiefs and so on. Riding a pure white horse was a sign of high position or affluence. White horses were described in folklore and portrayed in early art as animals of tremendous endurance and beauty. 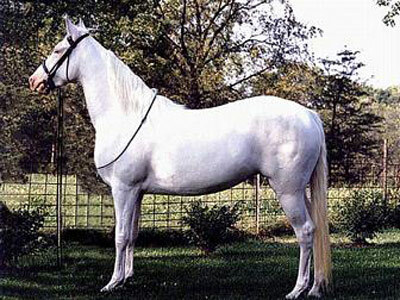 The American Albino Horse Association represents horses that are white. It was started to recognize offspring of a single white stallion named Old King, who had the reputation of producing many pink-skinned, white foals from solid-colored mares. Old King was purchased in 1918 and taken to a ranch in Naper, Nebraska. It was assumed that he was of Arab-Morgan ancestry, due to his conformation. From 1918 to 1936, Caleb and Hudson Thompson, his owners started their venture with a herd of Morgan-bred mares to produce a breed of all-white horses. In 1936, they realized the need for a recording system wherein breeding records could be maintained for future guidance in their breeding program. In 1937 the American Albino Horse Club was formed at the White Horse Ranch in Naper, Nebraska. Its object was to collect, preserve, and verify the pedigrees of the American Albino and to promote interest in the various types of the American Albino. Lethal white syndrome is a genetic disorder linked to the "Frame" gene and most closely studied in the American Paint Horse. Affected foals are carried to term and at birth appear normal, though they have pink-skinned all-white or nearly-white coats and blue eyes. However, the colon of these foals cannot function due to the absence of nerve cells, and the condition cannot be treated. Foals with Lethal White Syndrome invariably die of colic within 72 hours, and are usually humanely euthanized. Carriers of the gene, who are healthy and normal, can be identified by a DNA test. While carriers often exhibit the "frame overo" pattern, this is not a dispositive trait and testing is necessary, as the pattern can appear in a minimal form as normal white markings or be masked by other white spotting genes. Even still, the qualification of dark eyes requires parents who carry genes for off-color coats, thereby creating a 5 percent chance that the off-spring will carry some off-color. White horses have unpigmented skin and a white hair coat. They are born white and remain this way throughout life. Most white horses have dark eyes, though some have blue eyes. Some white horses are born with partial pigmentation in their skin and hair, which may or may not be retained as they mature White coloring, whether White markings, white patterns or Dominant white are collectively known as depigmentation phenotypes, and all are caused by areas of skin that lack pigment cells. Depigmentation phenotypes have various genetic causes, and those that have been studied usually map to the EDNRB and KIT genes. However, much of the genetics behind various all-white depigmentation phenotypes is still unknown.